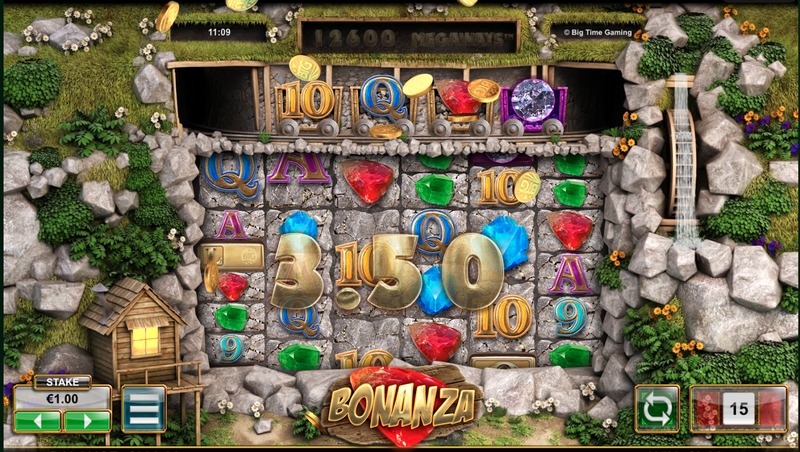 Bonanza is a nice looking, mining based slot in the vein of Goldrush, but with a precious stone twist and a whole range of twists on the standard slot machine’s gameplay. 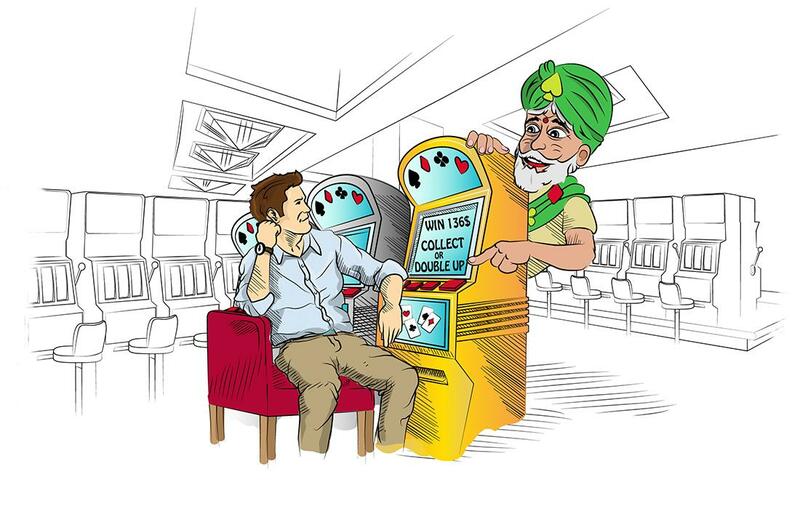 In particular, the free spins and accompanying multipliers stand out in making this an exciting game to play. We highly recommend this one to high-variance players. 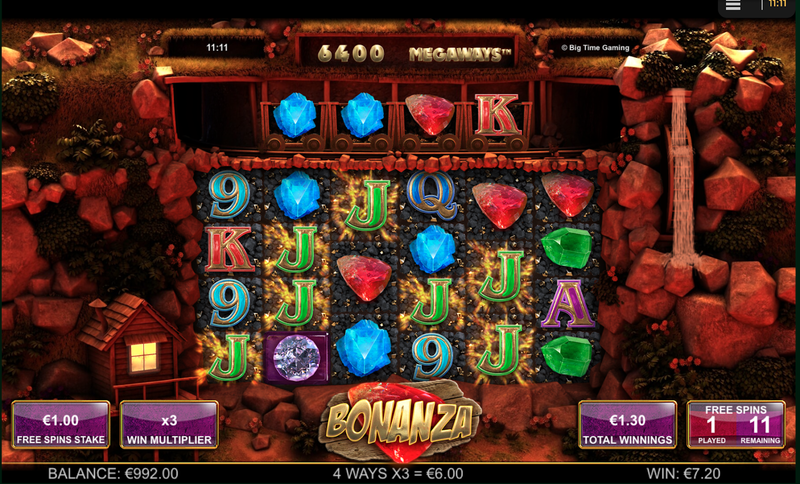 Bonanza Megaways is an extravagant, mining based offering from Big Time Gaming, which takes the hunt for treasures underground. With a mining cart theme and a range of symbols from precious stones, gold bricks, mining carts and dynamite the imagery is on point. While old school mining themes are a dime a dozen, this one is nicely understated and designed to within an inch of its life. The animations and artwork are very high end. The symbols are all beautifully designed, both detailed and easy to pick out at a glance. There is a steel guitar twanging away at a Western-sounding tune to give a sense of the old-timey cowboy setting. Unfortunately, it is extremely invasive and repeats far too often. Much better to just hit mute on that. The whole thing is rendered in high def against an idyllic backdrop of water mills, grasslands and wooden cabins. 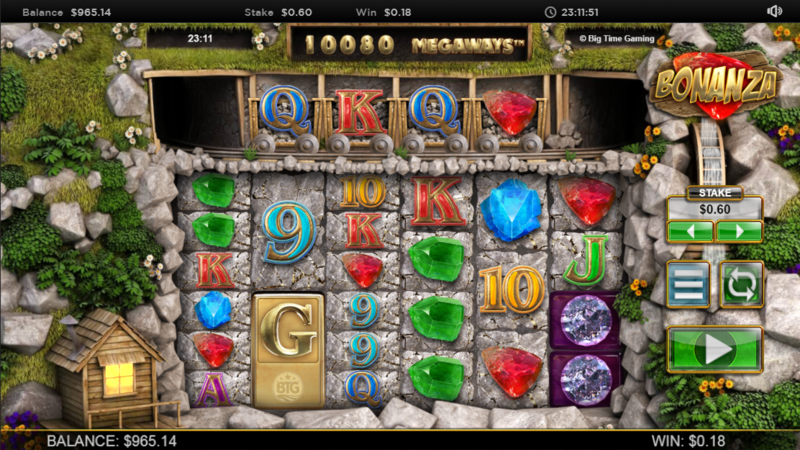 Bonanza uses the Megaways payout system where you need to simply hit a symbol in consecutive reels starting from the left. This does away with win-lines. Building on the Megaways system they have a bizarre 6 reel structure with different sized symbols resulting in a different number of symbols on each reel each spin. In addition to this, any winning symbol is removed from the reel and is replaced by a symbol either from above or in the top row (the carts) from the right allowing other symbols to fall into the newly vacated spaces. This process is called a "Reaction" and is important for the bonus rounds where it acts as a multiplier. The result is surprisingly intuitive despite the numerous little variations and subrules in play. Each of the innovations adds a little spice to your spins. The game even has a twist on the Wild symbol. 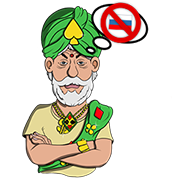 Here you must hit four Scatters – each one with a letter of the word G-O-L-D – to activate 12 free spins. You can also gain another 5 spins if you hit the 5th Scatter symbol which has "+5" on it. 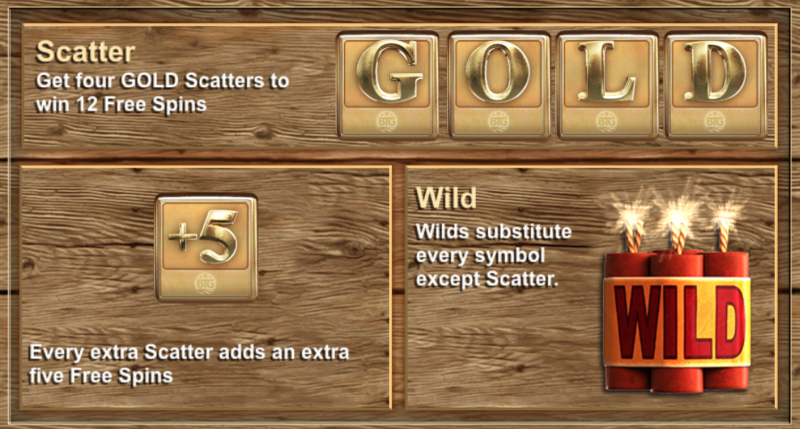 These spins come with multipliers and a new Scatter symbol that can trigger further free spins. The multipliers add up quickly with each "Reaction" adding x1 to the multiplier. 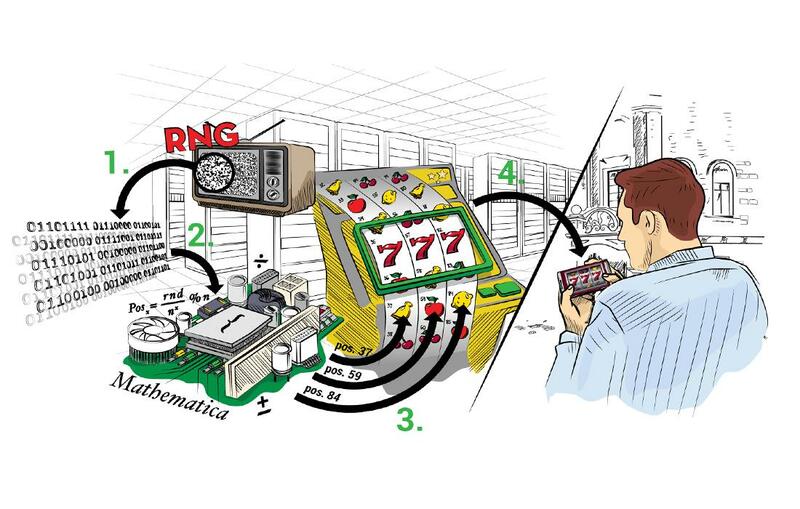 The result is the more times you hit a winning combination the bigger the multiplier making for the exponential growth of winnings during bonus rounds. The RTP 96.0% is smack dab in the middle of the range we guestimate as average here, which is at least not a black mark against Bonanza. The variance is pretty high on Bonanza so tailor your bankroll and strategy around that. The bet sizes are limited by the lack of winlines (as is the ability to control the variance much). At the site that we tested this still allowed a decent range from €/£/$0.10 to €/£/$50.00; this doesn’t allow much room for the real high-rollers but depending on your site your mileage may vary. Bonanza is an excellent slot, with a decent RTP and plenty of bells, whistles and twists to keep even the most cynical slot-artist entertained. The high-variance works well with many of the strategies we recommend and the overall design is to die for. Just remember to turn off the music if it is not your thing.